This fall we are having fun experimenting with a new project on the farm - Hoshigaki. 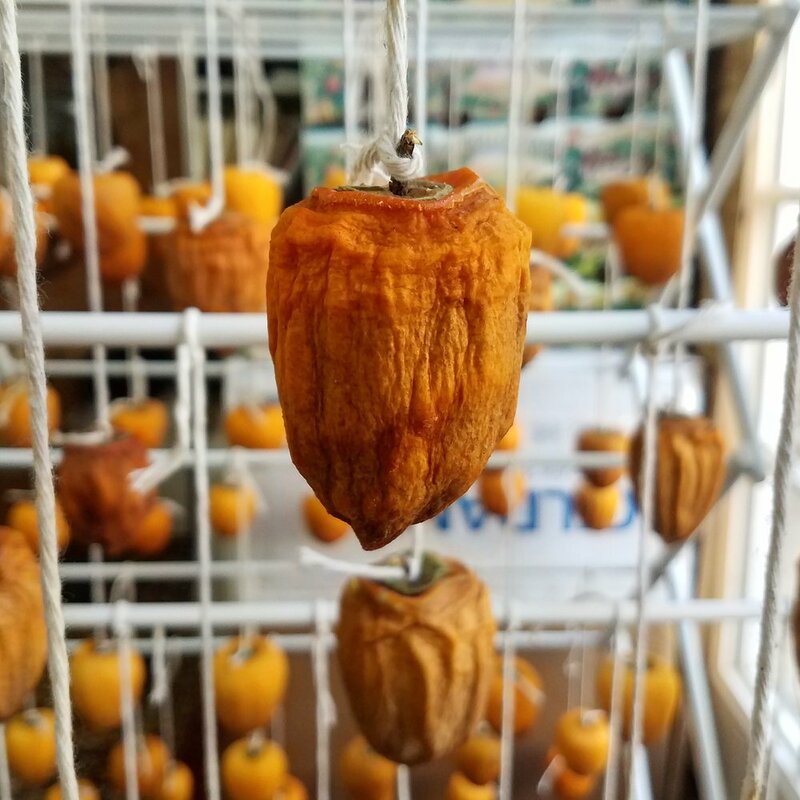 Hoshigaki is a traditional Japanese method of drying Hachiya persimmons. It is a very labor intensive process requiring lots of time, patience and care, so not surprisingly it has been lost with commercial and fact-paced food production. Three weeks ago, the two of us checked on our Hachiya persimmon trees that live next to our Suncrest peaches. The fruits, which grow in clusters, were firm and slightly green around the leafy stem (also called calyx)- which meant they were perfect for this project! Typically, you harvest and eat Hachiyas fresh when they are very soft and ripe, but for Hoshigaki drying, they need to start out firm. That day, we harvested about 50 perfect and blemish-less fruits. Before drying, we had to prepare the fruit by removing the calyx leaves and peeling off the skin. Next, we carefully hung each persimmon with butcher’s twine onto an old clothes drying rack. This is the first example of how much care, dexterity, and delicacy is needed to execute Hoshigaki. Tying twine onto the little stem of the persimmon is not an easy feat! Once hung, we set this rack by a window in our office next to the oscillating fan to allow for good airflow. To complete the entire process, it requires that the preparer gently massage the persimmon every couple of days (or every day) to break up the pulp and allow the inherent sugar content that lies within to surface on the outside of the dried persimmons, to create a coat of frost. This method can be fatiguing to the hand and your patience, but if you can overcome these aspects and allow the mind to slightly wander, allow the practice to take over, it can be restorative and even meditative. The art is complete in about 6 weeks and traditionally served with a simple cup of green tea and/or given away as gifts. In the hurried world we live in these small acts of taking care, taking time, respecting the food culture and its history, to place one's hands onto nature, can be an act of defiance and heroism.